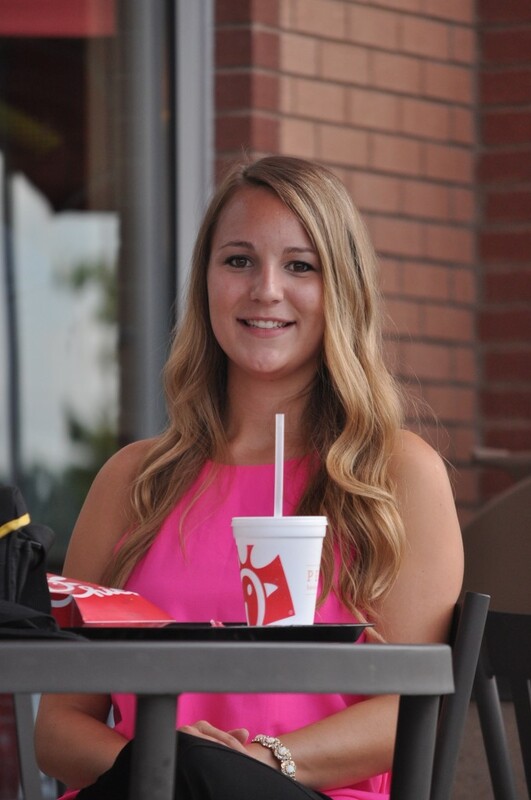 Her hometown of Locust Grove, GA is best known for a collection of outlet stores just off the interstate and for its proximity to the not-so-little town up the road, also the birthplace of Chick-fil-A. “I grew up going to the first Dwarf House in Atlanta. I still remember running through that little red door,” she says wistfully. She should remember it. She’s only 24, yet in just a few years, she’s managed to make serious strides towards accomplishing her lifelong goal of writing and singing songs in Music City. And now, thanks to a little bit of chicken and a whole lot of courage, Erin just might be taking her talent to the next level. On Monday, May 18th, this Dolly devotee walked into the Chick-fil-A on Charlotte Pike owned and operated by Will Sims and sang for her supper. That alone is nothing new in a town populated by artists rich in dreams and short on dollars. Erin’s ambitions, however, went beyond the free evening meal awarded to anyone willing to perform a jingle. Seven Music City Chick-fil-A restaurants invited aspiring artists to compete for a chance for one winner to meet with Nashville Universe executive Michael Kenney, image and career coaching from Suzanne “Mama Sue” Skinner of So Good Entertainment, and a chance to perform during Nashville’s biggest event, CMA Fest…in other words, a jackpot for anybody hoping for a career in the music business. To enter, contestants composed an original 30-second Chick-fil-A jingle, performed it live in a participating Chick-fil-A restaurant during dinner hours, and uploaded a video of their performance to YouTube. According to Will Sims, hundreds participated, with performances ranging from young kids improvising on the spot to trained vocalists like Erin vying for prizes that could further their professional goals. “Music is such a part of the culture of Nashville, and hosting this competition was a way for us to plug into what is important to our guests,” Sims said. Erin gratefully acknowledges that winning this competition is the biggest opportunity of her career, which while in its early stages, already has an impressive trajectory. Before graduating from LaGrange College with a double major in vocal performance and Spanish, Erin created an internship in Nashville for herself by contacting the late Billy Block, an iconic and widely respected entertainer and promoter, and convincing him to give her a shot as his assistant. Hustling up snacks backstage for artists at his weekly showcases, cataloging demos, and running errands for Block led to part-time jobs at The Ryman Auditorium, Nashville’s cherished “Mother Church” of country music, and at music publisher BMI. As a result of her hard work and initiative, BMI recently offered Erin a coveted full-time position, where she will work on a team dedicated to supporting BMI’s impressive roster of artists and songwriters. Having found a way to break into such a competitive industry, Erin’s future looks bright. When asked what she hopes for ten years down the road, Erin pauses and looks down. “I want to honor the Lord with my music, and I’ll still be doing it whether I make it big or not,” she says. Sitting just a few feet from a quote on the wall encouraging excellence in all things by Chick-fil-A founder Truett Cathy, Erin’s approach seems just right. To learn more about Erin, visit her website, www.ErinHazelrig.com.